Volunteers have planted about 10,000 trees along Veterans Pkwy. 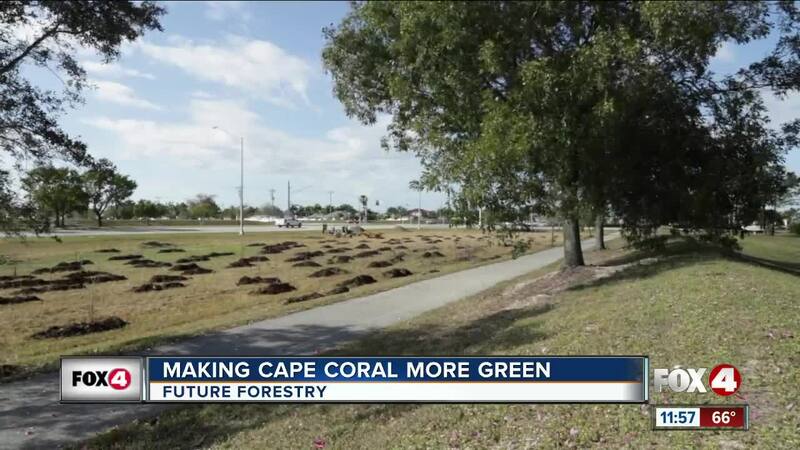 CAPE CORAL, Fla. -- Thousands of trees already planted, but there’s still more to go. Future Forestry is a volunteer group working to beautify Cape Coral. Founder Russell Ringland along with others have planted almost ten thousand trees along Veterans Parkway, hoping to add some shade to the sunny area. “This is a great place to do it because we have extra space along the highway and can put a lot of trees close together,” Ringland said. Saturday, Ringland and volunteers added mulch around the trees they’ve planted. This helps to contain the moisture for the tree and eventually breaks down into soil, which is healthy for the environment. “Some people would just go in and fertilize these, but this is essentially a slow-release fertilizer,” Ringland said. This many trees will also help to reduce our carbon footprint. “The pines and the cypress will grow for at least a hundred years, and during that time they’ll soak up a lot of carbon,” Ringland said. Longtime friend of Ringland’s Jeff Wunderlich has shown up every time Ringland asks him to lend a shovel. He says he’s happy to see the work his friend has accomplished. “His dream his passion is so you can’t see any cars along veterans parkway,” Wunderlich said. Several new volunteers were there to lend a hand. Dakota, an 8th grader in Fort Myers, says she loves helping others out. “I wanted to help out the community and make it look beautiful again,” Dakota said. Russell wants that too, as well as taking care of the planet. “I’m certain that my carbon footprint is covered,” Ringland said. Ringland ordered 1,000 more trees to plant at the berms along Veterans Parkway.